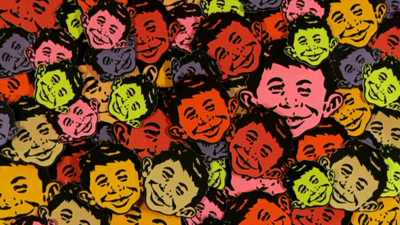 There can be few people that, even if they’ve never picked up a copy of the magazine itself, have not at least heard of Mad or its curious mascot – the original “What, me worry?” kid – Alfred E. Neuman. Created by Bill Gaines and Harvey Kurtzman as an antidote to their own brand of pulp horror comics that had given the comics industry a controversial name in the 1950s, the satirical Mad Magazine offered a humorous counterpoint to those publications and over it’s continuing, almost 60-year run, has become an instantly recognizable American institution. Eventually becoming a part of the vast TimeWarner empire when Gaines sold Mad to National Periodicals, which then became the later Warner-owned DC Comics, Mad continued to be published by Gaines until his death in the early 1990s, and he resisted all forms of genuine advertising in the magazine so as to not dilute or become confused with the parody ads that filled some of its pages. 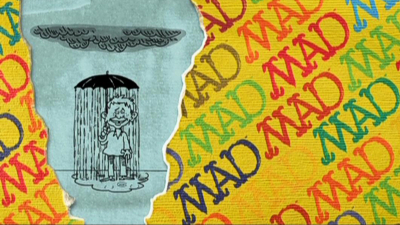 Color – and the advertising to pay for it – was eventually introduced to Mad, (as in crazy, not angry), which took something away from the intentionally “cheap” (a double entendre that I’ve always found amusing) printing. 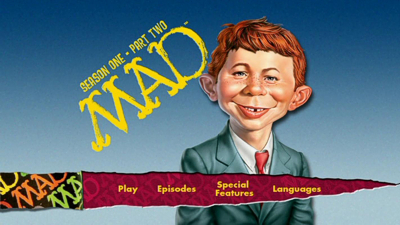 However, throughout its success, Mad has found it hard to adapt to any other medium (and some would say rightly so), especially filmed entertainment. Television, and more specifically animation, seems to be the only way it might be done, although previous attempts (a 1970s animated special, an embarrassing 1980s movie, and an aborted Hanna-Barbera show) didn’t really stick, and the 1995 to 2008 live-action Fox series MADtv may have run for 14 seasons and earned numerous Emmy wins, but didn’t really capture the spirit of the magazine’s pages. 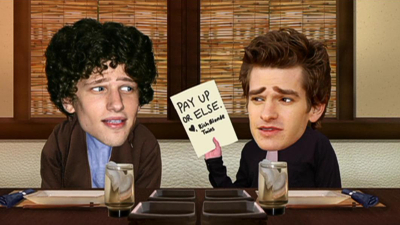 However, with the current series Mad, largely the work of writer-producer Kevin Shinick – a Cartoon Network Adult Swim alumni also responsible for collaborating with Seth Green on Robot Chicken – I believe they’ve hit the nail on Neuman’s head, rendering multiple random skits, concept-mashes and, yes, fake ads, in a scrapbook style of various animation techniques that is thoroughly in tune and in keeping with what has made the original Mad unique for all these years. The tone is pure Mad Magazine, too, forgoing the current trend of spiteful, expletive infused “comedy” that sadly now seems to be the norm, but being just as funny, and actually funnier in fact, with an affectionate wink at their targets. 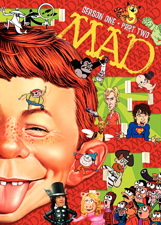 Mad, the magazine, has always been silly-funny, taking plenty of pot-shots and sly digs at some easy and some not so obvious targets, and filling its pages with sometimes groaningly awful puns (which I love), and it’s this playful approach that continues with Mad, the series. Like each issue of the Magazine, the Mad show lines up each episode’s items in fairly routine manner: we get a “main feature” movie or TV pastiche, a fake advertisement or two, Spy Vs. Spy, a celebrity putdown, some other random bits of business that recall the page fringe doodles of the printed edition, and another spoof of something or other, all featuring ideas lifted from the Magazine’s pages and “the usual gang of idiots” and squashed into a non-yawn inducing, surprisingly short length of just eleven or so minutes per episode – actually the show’s strongpoint, since it never outstays its welcome. 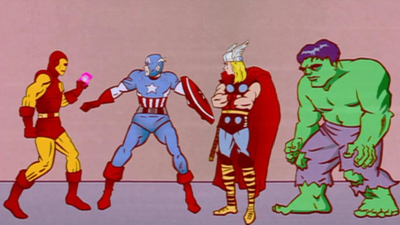 Also keeping things fresh is the never-ending change in animation design: some South Park-style cut-outs for some skits, Robot Chicken-like stop-motion for others, or hand-drawn and Flash-enhanced cartooning elsewhere that mocks work from every studio from Disney to Filmation. 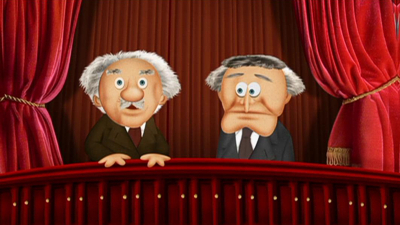 Usually the movie lampoons use the original actors’ heads on animated bodies, like South Park does for selected celebrities, and the effect is much the same; an odd-approach which totally works but just feels suitably a little off. 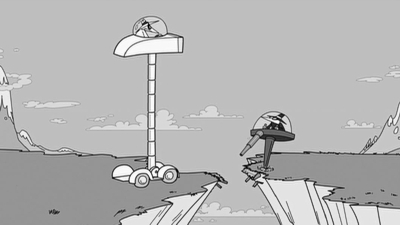 Spy Vs. Spy retains its black and white look, perfectly, while at other times Mad Magazine’s famous use of caricature pulls off the right feel for the right pastiche. Coming from different animation vendors helps each item to come up fresh each time, and its in these ever-changing visuals that Mad keeps us entertained. 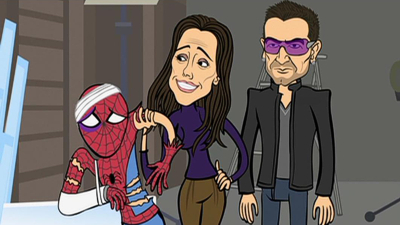 With each skit lasting anything from just a few seconds (the amusing fringe gags, for example) to a couple of minutes for the longer clips, it’s akin to flipping the pages so that there’s always something else on the way to keep us smiling. Another cue from the Magazine is taken from where the printed edition would spoof one or two particular big blockbusters in any given issue, often blending in “break-ins” from other movie characters for a panel or two. Here, the melding of two properties together create their laughs from these unlikely parings, so a Pokemon Park mixes in the Japanese craze with the dinosaurs of Steven Spielberg’s genetically engineered theme-park to a generally amusing effect (even if it’s not the best skit to start off on), while you can guess what So You Think You Can Train Your Dragon How To Dance meshes. Other highlights in this second half season of 13-episodes include a man who forgets his hand is a bomb, the Bourne-meets-Toy Story 3 spoof The Buzz Identity, speedy car monkey business in The Fast And The Curious, an all-too-brief but funky Soul-Tron, a poke at Facebook and The Social Network, the bizarrely random look at muiti-verse superheroes Avenger Time, and a Muppet Show lampoon, among others. 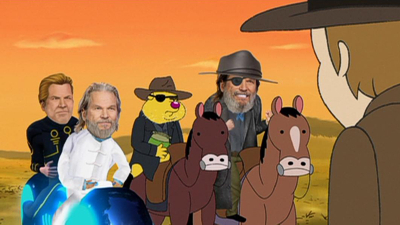 Best of the bunch, however, are the very funny Pooh Grit, in which the honey-loving bear (a spot on vocal impersonation of Jim Cummings’ Pooh) is twisted into the Jeff Bridges western, and Smallville: Turn Of The Clark, which takes some pretty near-the-mark pot-shots at the Spider-Man musical transposed to the young Superman universe. As with the first half of the season, Mad succeeds as a slice of silly fun because it doesn’t take anything seriously, doesn’t feel the need to contemporize itself by adding in bad language for the sake of it, and ultimately sticks true to its printed magazine roots. It’s still fun to see Alfred E. pop up once in a while for a spot gag here and there, too, a nice tribute to the print edition and something of a nod that the current creators know whose footprints they walk. May they continue to do so with such a fun testament that is well in keeping with their source inspiration and blazes its own trail for warm, funny humor – in the jugular vein, of course! Again, Warner Home Video continues its policy of releasing television seasons in multiple sets, meaning that although Mad’s purchase price is around a reasonable $15 online for two and a half hours of content, surely a two-disc set of the entire run would have been preferable. Once more there are no actual bonus features to speak of, unless you count a Mad Digital Comic that simply turns out to be 23 still gallery images of a Mad Magazine preview copy that now seems to find itself being sold as an item “as seen on Cartoon Network”. The 1970s archive special would have been most welcome and I’m sure I have seen documentary material on Mad Magazine’s celebrated print edition, but these images don’t cut it: they’re probably very funny, but the small print doesn’t allow for any actual reading and it just comes off as a crude ad (cheap!). All there is are a handful of trailers for other WB titles – a teaser for Green Lantern: The Animated Series, Young Justice and ThunderCats – although again I suppose one can’t complain too much for the amount of content on the disc and the low list price. Surprisingly for a “budget” disc, the first half-season of Mad got a bright o-sleeve slipcover that made the package feel a bit more special. Unfortunately, there’s no such luck here, meaning that as well as feeling a bit more “cheap” (not without merit, I grant you) the two volumes won’t look too smart lined up on a shelf either. The design is as before, creating a scrapbook collage of the characters and content to be found inside the box, and though there’s a mention of “bonus shorts”, its hidden in the details and doesn’t suggest anything special. With two and a half hours of content on the disc, Warners can’t be accused of stacking too much on this platter, in keeping with their usual high standards of compression. 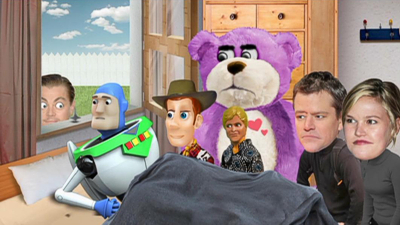 As such, the various animation styles never display any form of visual hindrance, but as with the first-half season the show once again does: presented in a “standard aspect ratio of its television exhibition” I refuse to believe that Mad is shown in 4:3 letterbox on its Cartoon Network airings. But that’s what we get here even though it’s clear the program is created in native 16:9 – and probably in HD – which is again a pretty sorry state of affairs. Luckily, but only just, the bright transfer and lack of compression means it can be blown up to fit a widescreen display and sustains a reasonable amount of quality…but, really, letterboxed transfers should be a thing of the past by now. Offered in Dolby Surround, each item’s mix is as good as each skit needs it to be, from sometimes minimal low-level murmurs to loud and bombastic music, usually synthesized but sounding pretty genuine. The recording and mixing again reflects the kind of audio we’d usually associate with the kind of content being lampooned, with spot-on impressions and timing, so everything sounds authentic as needed, which is where some of the humor is at its best. English hard of hearing and French subtitles are optional. Again much better than originally expected when I reviewed the first-half season of Mad, this second batch of episodes keeps the momentum going. 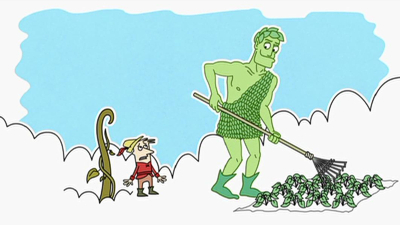 The lack of an Adult Swim styled contemporary re-tooling of Mad Magazine to bring it “up to date” is refreshing, the various animation designs very much keeping things feeling contemporary instead, while the writing and performing is as fast and furious as it needs to be for the modern world. Warners’ half-season release policy and the letterboxed lack of 16:9 frustrate once more, but I did again break out in giggles quite a few times and fans of the original Magazine should find that Mad’s second half season is just as funny as the first.